How can Roman mosaics best be illustrated? Mosaics are difficult to photograph even under good conditions: because of their size and situation, often only an oblique view is possible. Furthermore, many are known only from photos, usually black and white, usually oblique, and rarely of the entire mosaic. Thus to get an overall idea of what an ancient mosaic looked like, the best solution is a painting to scale, together with photographic evidence, and this is the solution adopted in the four-volume corpus of Romano-British mosaics by David Neal and Stephen Cosh, published by the Society of Antiquaries of London (20022010). The highlight of the corpusand perhaps the most controversial aspectis a series of paintings, illustrating virtually all the Roman mosaics found in Britain. There is a long history of the painting of the Romano-British mosaics. In the years around 1800, Samuel Lysons and his great rival William Fowler both painted a number of mosaics which were then engraved and sold with great success; the paintings by E.T. Artis of mosaics in the Peterborough area are a similar triumph, while the tradition continued into the early part of the twentieth century with the work of George Fox and his paintings of the mosaics from Silchester. Then came photography, and this was a disaster. The original photo of a mosaic from Malton, in Yorkshire, with grid superimposed. It was discovered and excavated in 1949. It was only recorded in oblique black and white photographs, and a single colour slide taken by a local photographer. Using these records it has been possible to 'recreate' the original extent of the mosaic (right). The 'recreated' mosaic from Malton. In the corners were the four seasons, of which only Winter survives complete. The semicircles at either end contain a hound in one and a deer in the other. Painting by David Neal. Instead of drawing mosaics, archaeologists began photographing them. They stood on the side of the trenches, often before the mosaic was properly cleaned, and then took oblique black and white photographs, often with heavy shadows falling across them. To make matters more difficult, mosaics sometimes undergo a strange pattern of reversal in black and white photography: the dark tesserae, being made of hard lias, are shiny and therefore show up as light, whereas the white tesserae are often made of limestone, which being matt, fails to reflect the light and often shows up as dark. It may be uncertain how different photos fit together, and colour is sometimes problematical: where there is a drawing, it is often only a rough sketch which is of dubious help, and colours are often only stated in the text of the report. It is only since the 1970s that the use of high photographic towers and modern photographic materials has enabled adequate colour photographs to be taken. Thus for the vast majority of known mosaics in this country, the best method of illustration may well be a painting. The modern study of mosaics in Roman Britain has been led by David Smith who wrote his doctoral thesis on Roman Mosaics, propounding the theory that many can be attributed to schools. He devoted a lifetime of work as lecturer at Newcastle University to studying them, and also helped to found ASPROM, the Association for the Study and Preservation of Roman Mosaics, which is one of the more friendly and successful archaeological special interest groups. In its turn, ASPROM is a member of the international organisation AIEMAL'Association International pour l'Étude de la Mosaïque Antique, a body which is promoting the concept of producing corpora of Roman mosaics. The French have been in the forefront in this, producing a corpus of Roman mosaics in Gaul and, for Tunisia, a number of fascicules have been produced. However these largely lack colour and use mainly photographs; the British corpus is in colour. The corpus is being produced by David Neal and Stephen Cosh. David Neal drew his first Roman mosaic in 1958 when he was still a teenager and was excavating with Sheppard Frere at Verulamium at the weekends and holidays. He had left art school at 16 and went to work as a graphic designer for the Gas Board ('I can still draw Mr Therm'). Shortly afterwards he abandoned the Gas Board to become an archaeological illustrator for the then Ministry of Works, the predecessor to English Heritage, where he soon began drawing mosaics as part of his job. Eventually in 1981 a catalogue of his drawings was published as the first Britannia Monograph, with colour microfiche transparencies of the drawings in a pocket at the back of the volume. This covered some 88 drawings and the volume was a great success. A major turning point came over the affair of a mosaic from Brantingham in Yorkshire. The Brantingham villa was discovered during the war in the course of quarrying. It was hastily exposed, and then covered up, but in 1948 Hull Museum went back to lift the mosaic for display at the museum. However overnight it vanished: it was stolen and has never been seen since. Rumour has it that it had been loaded into a military aircraft and was in America before its loss was discovered! All that remained were a number of oblique black-and-white photographs. 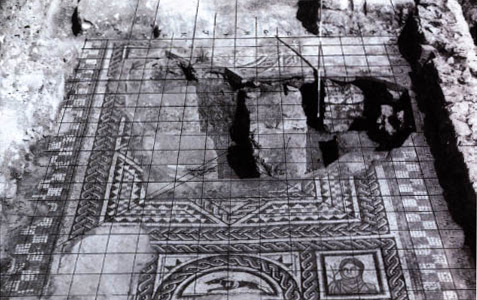 David set to work to see if he could reconstruct the mosaic and, perhaps to his surprise, he succeeded and the preliminary drawing was published in the 1981 volume. This showed that it was possible to reconstruct mosaics which no longer existed, from black-and-white illustrations and even to restore the colours. Thus when in 1993 at the age of 53 he was offered early retirementhaving been with English Heritage and its predecessors for 32 years, 16 of them with the Archaeological Drawing Department and the latter 16 with the Central Excavation Unithe decided his drawings could form part of a full-scale corpus. In this he was joined by his friend and colleague Stephen Cosh, the Secretary of ASPROM, who had also long been painting mosaics, mostly in the south-west. Steve originally read History at Reading University and then spent 22 years in teaching. However, finding teaching more and more stressful, he decided to retire and concentrate on his mosaic research, and he now works part-time, which gives him income and every afternoon for his research. He began his research on mosaics for his undergraduate dissertation on Roman Hampshire. At the time the Sparsholt villa was being excavated (CA 12) and one of the best finds was a superb mosaic which he attempted to recreate using pieces of coloured paper. This produced a fantastic result but it was even more time-consuming than painting, so by the time he met up with David Neal at ASPROM he had already decided to start painting mosaics, on the same scale of 1:10. The two evolved their styles together so it is difficult to tell apart the work of the two artists. Having decided to collaborate, they resolved that it would not just be a collection of paintings, but a proper corpus. All known mosaics would be listed, county by county, site by site, and room by room. There would be a description and discussion of each mosaic, and all the photos and plans that form the primary evidence would be reproduced. Indeed, a by-product of the corpus is that it forms an unrivalled collection of the plans of Roman villas. Thus even though the paintings predominate, the descriptions and the primary evidence, especially photographs of all figured mosaics and early engravings, form the core of the books. A fragment of the Horkstow mosaicone of the best-known in Britain because of the depiction of the chariot race at the bottom (painting by David Neal). Many of the mosaics present major problems of interpretation. A good example of this is Horkstow, Lincolnshire. This was discovered around 1800, and was painted in situ by both Lysons and Fowlerwith interesting differences. The mosaic was lifted in 1926 and was displayed in the British Museum. Subsequently it was taken to Hull, where various fragments still exist, again with subtle differences from the two paintings. Which version is correct? Photos of the surviving fragments are included in the Corpus, together with Lysons' and Fowler's original engravings; but there is also a new painting that will present a picture of the whole mosaic as it was rediscovered in 1926. The volumes contain a number of highlights. One of these is the Woodchester mosaic, which is reputedly the largest Roman mosaic north of the Alps. It probably formed the main audience chamber of a palatial villa, and its existence was known before 1695, since when it has been periodically uncovered and reburied. It was last exposed in 1972, when David drew it in situ over three weeks and took photos of the whole area. The painting then took 18 months to complete. The problem was its sheer sizeover 5 feet square, at their standard reduction of 1:10. A piece of paper had to be specially made at a paper mill in Kent, which then had to be dry-mounted on a board to stop the paper warping as it was painted. 'It was a big stretch because you had to lean over to paint in the middle. I got more and more paranoid about spoiling it and eventually I kept it all covered and only uncovered the little piece I was working on.' When he had finished, it was a further 18 months before David felt he could tackle another mosaic. It is the reconstruction of mosaics from various sources that will provide some of the greatest revelations. A good example is Steve's reconstruction of the mosaic from the Lufton villa in Somerset. This was excavated in the years after the war by Len Hayward. A number of oblique black-and-white photos were taken, there was a sketch plan of the overall design with notes as to the original colours, and in addition, the excavator's wife had made a 'rubbing' on sugar paper of the central scene, and then had coloured it by hand. There was also one colour slide. 'I gridded up all the photographs, fitted the various pieces together and then traced it off. Eventually I took the painting to Len Hayward to show him. He was thrilled with it, because it took him back to when he was excavating it 50 years before, and he had never seen it overall in colour since he had dug it up.' Sometimes it is even possible to 'improve' on the surviving mosaic, for loose tesserae often survive in museum collections, and by cutting these in half one can get an idea of the original colours, so the mosaic can be painted as it originally was, and not in the state in which it has survived! Paintings © David S. Neal and Stephen R. Cosh. Thanks to Current Archaeology for permission to reproduce the substance of this article; it has been amended slightly to reflect the fact that the Corpus has been completed since the article was published. This page is maintained by Ruth Westgate. Last modified 23 July 2011.